Scientists have discovered a powerful weapon in the fight against global warming. The world’s first negative emissions power plant has opened in Iceland. 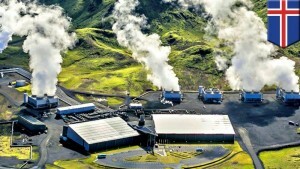 With the vital issue of global warming in mind, Iceland has gone beyond zero by developing a power plant that actually removes CO2 from the atmosphere. Researchers at the Swiss company Climeworks, have developed the world’s first commercial direct air capture (DAC) plant, which is designed to pull CO2 out of the air. Climeworks has joined forces with a geothermal power plant in Iceland and is removing carbon dioxide from the atmosphere by turning captured carbon emissions into stone. Initially, CO2 is captured from ambient air using Climeworks’ patented filter. The gas is then bound to water and sent 700 meters underground. When CO2 comes in contact with basaltic bedrock, it forms a permanent solid mineral. The best part is that once CO2 is locked into the minerals, it cannot enter the atmosphere for millions of years.